The UrbanLite is one of three newer Graco lightweight products. As you may notice, single wheels are all the rage in stroller design and Graco’s finally gotten on board with their lovely UrbanLite. The UrbanLite weighs just under 20 lbs, yet it can hold your child up to 50 lbs. The seat reclines until flat and can carry your Graco SnugRide infant car seat to make a travel system. Parents enjoy using the UrbanLite with its adjustable-height handlebar and very generous shopping basket. The sun canopy is impressive on this new model as is the tight, compact fold. Measures 28L x 19W x 40H in. Lightweight stroller weighs less than 20 lbs. The UrbanLite is quite exciting and so far consumers feel the same way with owners writing in with their impressions and giving it high marks. Let’s hope this trend with Graco continues! I personally purchased this product to test and give you my first-hand impressions. I tested the UrbanLite with 30 lbs in the seat and took it on a neighborhood circuit on bumpy sidewalks, over grass, and through park mulch. 4 What is the seat like? 5 Tell me about the sun canopy. 6 What about the fold? 9 Where can I buy the Graco UrbanLite? 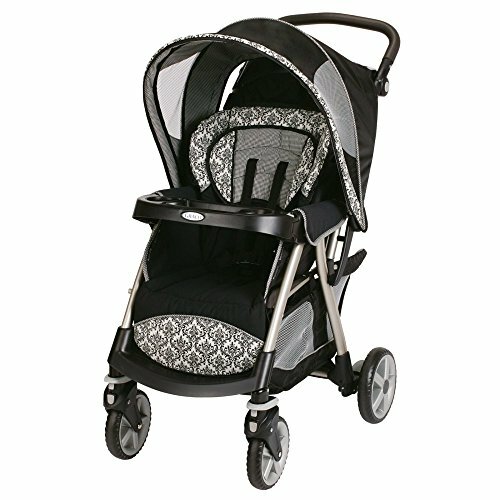 This is a sturdy lightweight stroller with a nice thick frame made of oval tubing for more strength. It can carry your child up to 50 lbs, yet the product itself weighs less than 20. The UrbanLite accommodates Graco SnugRide car seats and you can buy them together as a pair so that both stroller and car seat match. There’s something about single front and rear wheels that look more modern and sleek in design and it’s one of the many reasons why I like the UrbanLite. In terms of functionality, this stroller tracks rather straight and I like pushing one-handed and walking a bit to the side. I didn’t have to constantly adjust the stroller to go straight. Even with 30 pounds in the seat, I was able to pivot around in a tight turn in either direction. The suspension on the UrbanLite is pretty good! I took it over bumpy sidewalks with rather large cracks. Rubber tires on the UrbanLite help to smooth out the ride in addition to the suspension. The rubber is softer than hard plastic and gives more of a gliding feel. You don’t want your baby’s head bobbling around over hard bumps. You won’t get that with this stroller. What I do like are the linked brakes. One step on either side engages the brakes fully, and another step disengages. I was impressed with the seat in this all-terrain stroller. The seatback is tall enough for bigger kids and sturdy enough for smaller babies, with a really soft removable head support pillow included. Additionally, the seat strap adjustment slots go up to nearly the top of the seat. Many parents are not happy with the full upright position on some stroller models, but it looks like the UrbanLite seat sits upright enough so your baby can see out without slouching too far back. An adjustable 5-point safety harness switches over to a 3-point lap belt when your child is older for greater freedom of movement. The buckle is hit or miss with ease of use, and sometimes it sticks and is hard to release. The shoulder straps attach as plastic loops that fit through the lap belt to convert to a 3-point belt. The problem is that these loops constantly come off and I have to put them back on every time I snap the belt together. This is a bit of a downfall to an otherwise great seat. The seat recline is fantastic and couldn’t be more simple. Pull a lever on the back of the seat and it clicks into 3 different positions rather easily. It reclines completely flat for your car seat or for a very sleepy little passenger. 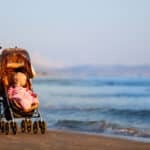 Because of the completely flat recline, this stroller is suitable for a newborn baby and you don’t have to use a car seat if you don’t want to. However, according to the user’s manual, the infant head support should be removed if the seat is in full recline. 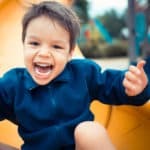 Now here is a highlight on the seat – the leg rest flips up and can be secured with Velcro tabs to create a nice, cozy enclosure for your small child. See how that looks at the photo on the right with the seat completely reclined. The top of the seat and the canopy are connected with fabric, to provide a nice, snug enclosure for your baby. This is especially good when the seat is in full recline, and if you have the leg-rest flipped up. It becomes like a bassinet. Tell me about the sun canopy. 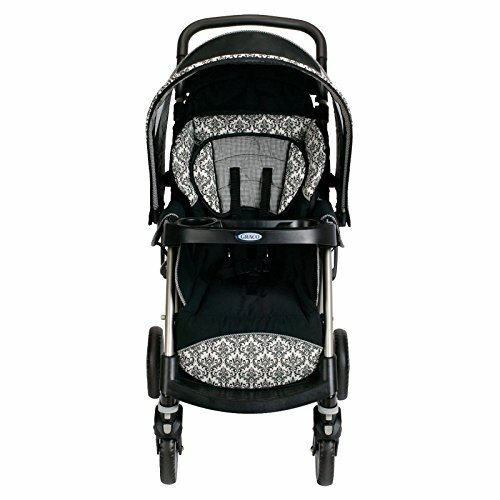 The sun canopy on the Graco UrbanLite is completely adequate for shielding your baby from the sun and wind. First, the canopy rotates 180° and comes down to the child snack tray. This means that whatever angle the sun is shining, your child will be protected. I really like that. While there is no peek-a-boo window at the top, the fact that the canopy ratchets forward makes up for it. Mesh side panels on either side of the canopy provide air flow, which is important because the enclosed space is so snug and secure, it would otherwise become stuffy in warmer weather. The fold is reasonably easy, and while Graco says it’s one-handed, I have to use both of mine. The user’s manual also shows a two-handed fold. Once folded, the stroller can stand alone – it rests on the rear tires and storage basket rim. Tuck the adjustable handlebar under and even remove the front wheels if you want, it’s easy to do with a push of a button. The UrbanLite has some great amenities for both parents and kids. First the storage basket. It’s HUGE, roomy enough for a large diaper bag and your purse and maybe even more. One thing I like about the basket is the dipped rim. Now you can access your basket when the seat is in full recline so you have easy access to your stuff. The adjustable height handlebar ranges from 37½” up to 41″ so that no matter your height, you will feel comfortable walking and not hunch over or kick the rear axle. The handlebar has a nice foam grip that absorbs moisture and is ergonomically designed for your hands. It was very comfortable to use. The UrbanLite has a parent tray with cup holders, but the word “tray” is stretching it a bit. The little space between the cupholders is pretty much useless. Even my keys (which are pretty minimal) didn’t fit! I can’t really figure out what it is for. Sticks of gum, maybe? The cupholders are OK and hold standard water bottles and probably your Starbucks. But my travel mug didn’t quite fit all the way in and was a little bit wobbly. I wouldn’t want to go over bumpy sidewalks without holding my mug. The child’s snack tray is pretty good, though. It has a rounded snack holder and on the other side is the cup holder. Between is a molded space for little toys or more snacks. See my personal video review of the Graco UrbanLite. Parents recommend the Graco UrbanLite for the lightweight and one-handed maneuvering. 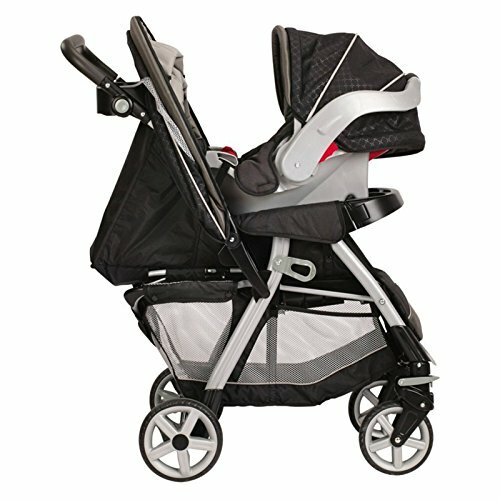 Most reviews are giving this stroller high marks! Many have mentioned how functional the product is for the price. 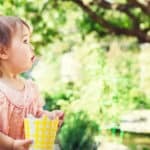 Mothers have mentioned how easy it is to put together, as well as the “chic design” and gender-neutral color schemes. Overall, in my opinion from the test run, I LOVE the new streamlined design with the single wheels. You don’t need the double wheels to smoothly go over sidewalk cracks, grass, and mulch. I’m also impressed with the sun canopy, the easy seatback recline, and the infant enclosure. The seat is nice and roomy for kids to grow and I like the soft infant head support pillow. As mentioned previously in the review, I wish the UrbanLite had a parent console with a better storage compartment between the cup holders. This was the biggest overall complaint with other reviewers as well. The buckle is also a bit difficult at times and the shoulder straps come off the buckle every time I unsnap the buckle. Lastly, and certainly not a dealbreaker, the parent cup holders could be just a tad bigger for my travel mug. Where can I buy the Graco UrbanLite? Ever since the UrbanLite was released, I’ve been looking around at different retailers and I recommend you buy on Amazon for the best price and prompt, free shipping. Just imagine all the compliments you will get, strolling around your neighborhood with your adorable new baby in a super sweet-looking UrbanLite.